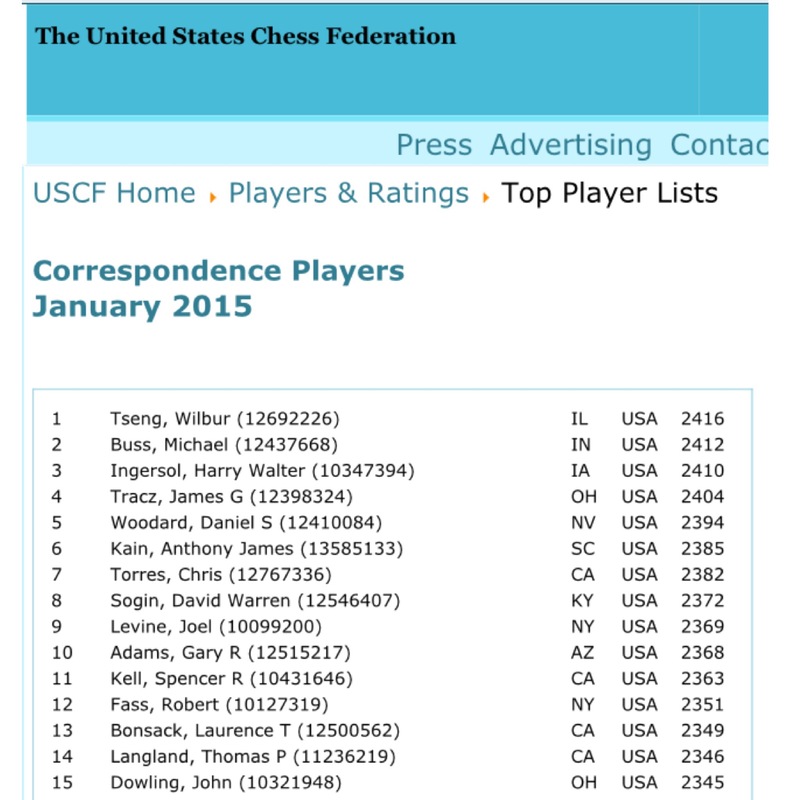 A lot has changed since the last time I did a post on correspondence chess. Now my level of play generates a constant stream of invitations to very prestigious events. 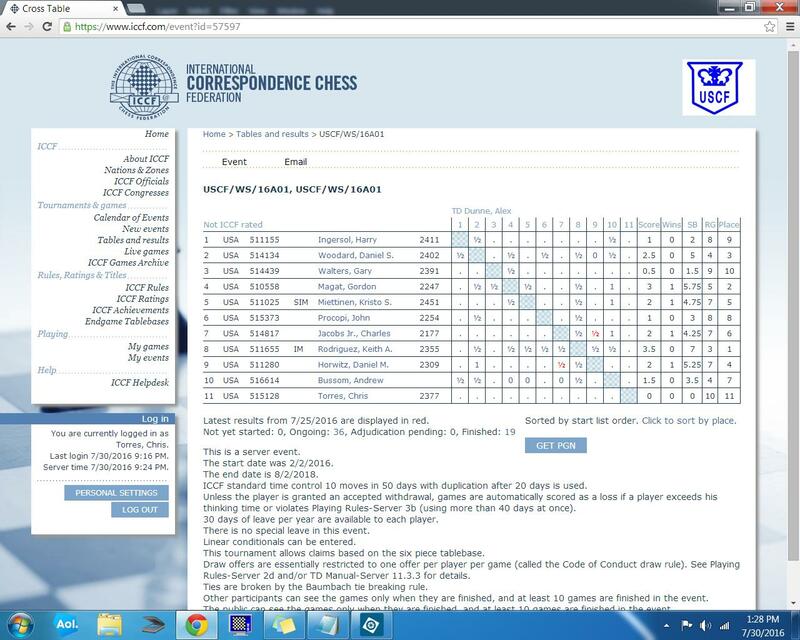 I have accepted most of these invitations in order to further challenge myself and continue to grow in chess. 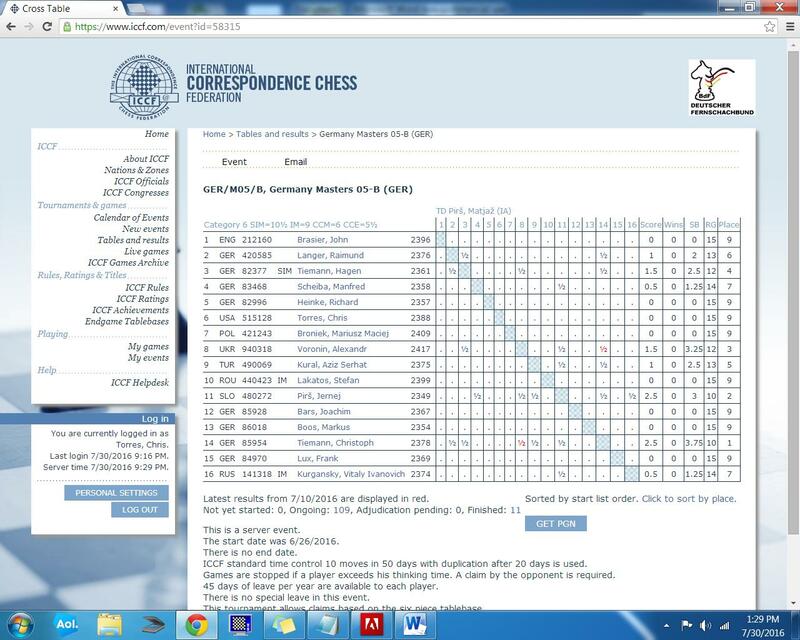 Below is a list of my current correspondence chess events minus a couple of friendly matches. hxg4 Ne3 10. Qe2 Nxc2+ 11. Kd1 Nxa1 12. g3 Qe8 13. b3 Qc6 14. Qd3 Nd7 15. Qd4 Nb3 16. Qxg4 Nxa1 17. Bh6 g6 18. Nc3 Qb6+ 19. Kh1 Qxb2 20. Qf4 f5 21. 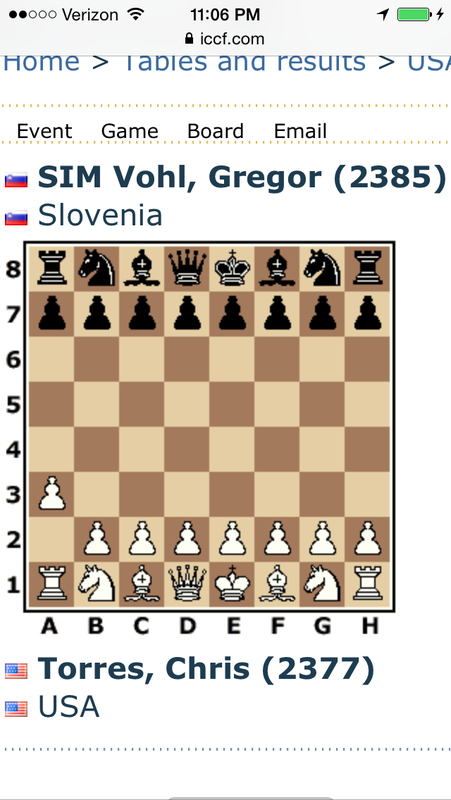 Free #Chess Win?! It Must Be Christmas! 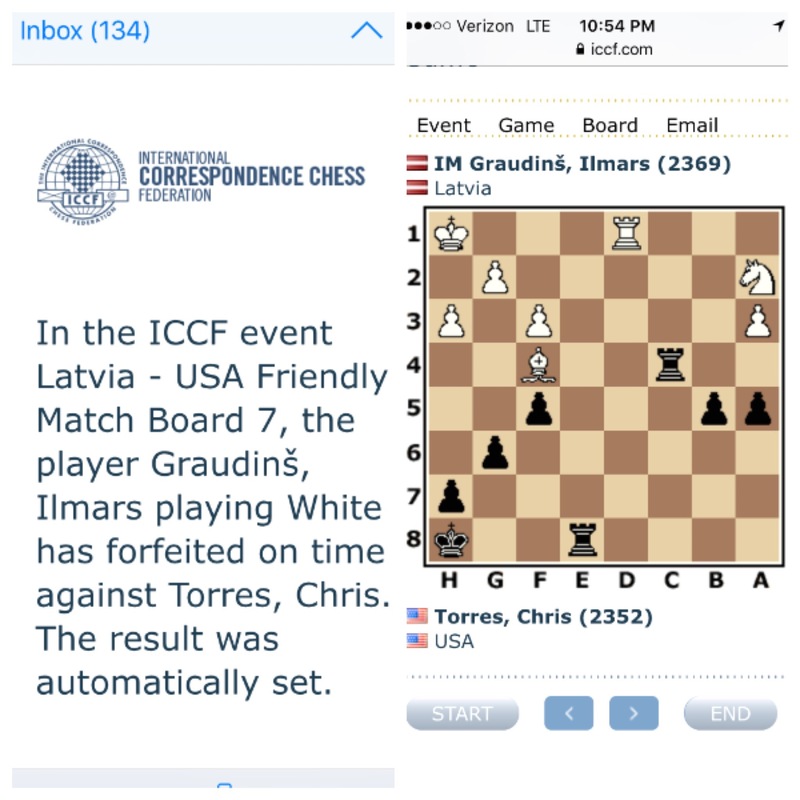 Just found out that my Latvian correspondence chess opponent accidentally stepped over his allotted time in a drawn position. Free win on Christmas!? I’ll take it! 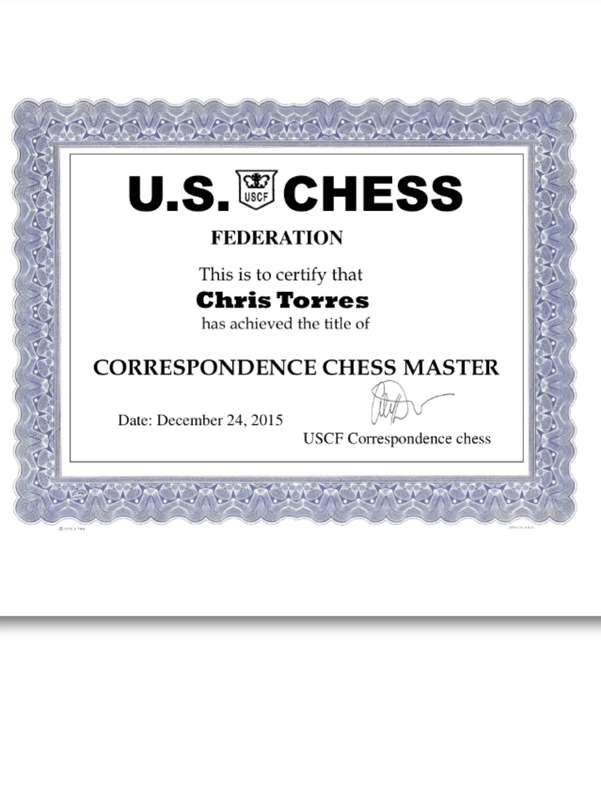 Congratulations on attaining the rating of Master in USCF Correspondence Chess. This is an excellent accomplishment and the attached certificate honors your success. The Spanish Association of Correspondence Chess (AEAC) is proud to Organise the “North Atlantic Team Tournament 7 (NATT 7)”. 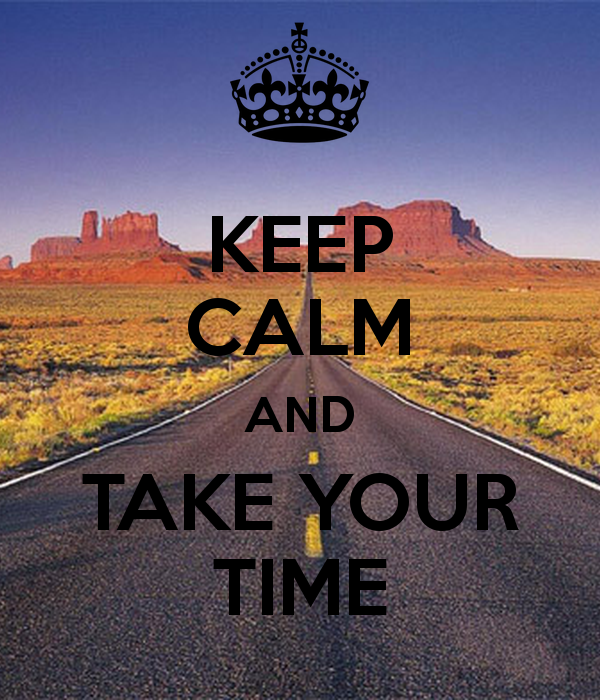 Reflection time: 10 moves / 50 days. License: 45 days / year. Special licenses not allowed. If possible, confirm to me the participation from your federation before 15 November to be able to structure the tournament. I ask you, Please, to confirm Me That You Will Participate. PS: Interests your federation to present 2 teams? 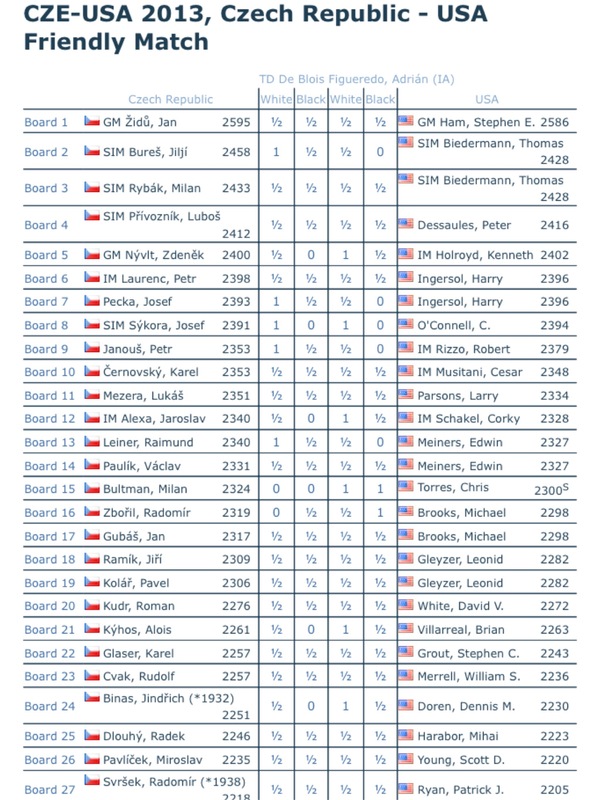 CZE-USA 2013, Czech Republic – USA Friendly Match TD De Blois Figueredo, Adrián (IA) Czech Republic White Black White Black USA Board 1 GM Židů, Jan ½ ½ ½ ½ GM Ham, Stephen E…. California has a long and rich history of correspondence chess extending all the way back to the days of the Gold Rush. 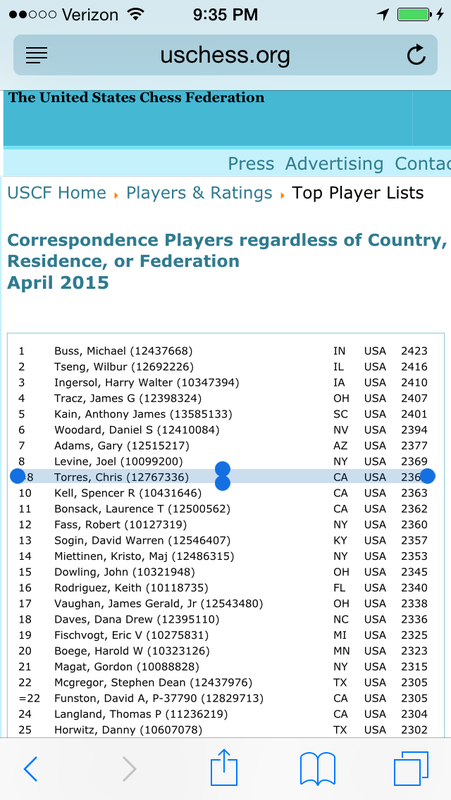 Below is the list of the top 10 correspondence chess players in the State of California according to the current United States Chess Federation rating list. 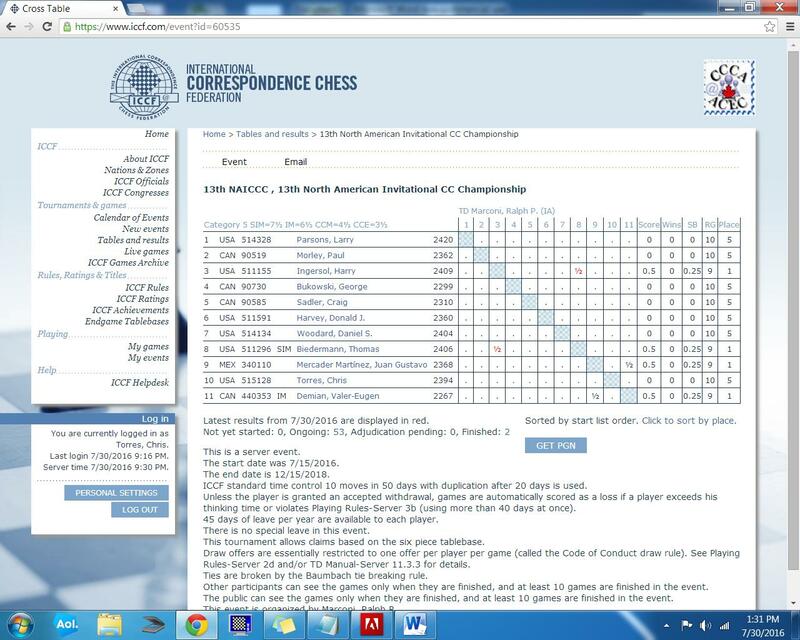 Panning through the databases for each of these player’s best games will undoubtably provide chess treasure hunters with many undiscovered golden nuggets from California Chess. 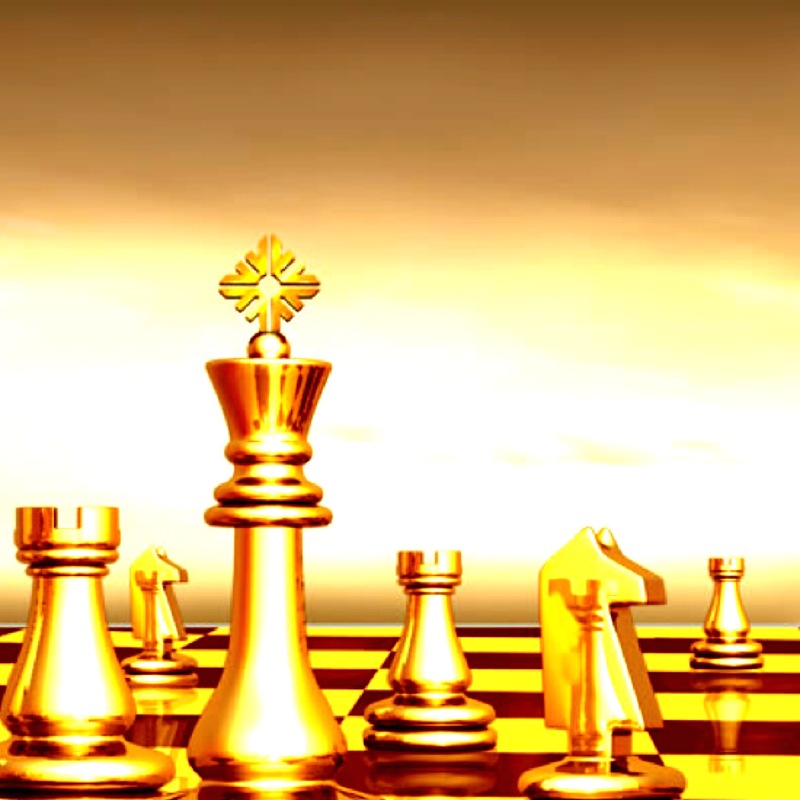 Should a white pawn manage to make it all the way to eighth rank, it must promote to any piece other than a king. In Spanish, a Rook in chess is called a “Torre” and every Russian schoolboy knows a rook on the seventh rank is particularly deadly!